If you have suggestions or wish to participate in the development of the History of Star Machine Works or Star reloaders, please post to the forum. If you have additions or corrections, please contact the site administrator. "The Star Machine was a giant leap forward..."
To understand Star's contribution to the "modern" history of reloading it is important to know how reloading was accomplished prior to the introduction of the Star tool, circa 1931 or 1932. Reloading used simple hand tools or required expensive, cumbersome, and very large equipment, not what we'd consider sophisticated or modern reloading tools. The Star Progressive was a giant leap forward. It was/is an advanced reloading tool pre-dating O-presses, H-presses, and the turrets. The Star design was not the invention of the progressive concept, but it was the first machine available to the public as a scaled down version of progressives used by major ammunition manufacturers. In 1934, a universal progressive was produced to allow easy caliber conversions. The Star Universal model has a modified base to support shell plates for various calibers. The powder drop is modified to increase capacity and primer feed supports small and large primers. The upgrades were part of the original design concept as patents show the design was intended for pistol, rifle, or shotgun rounds. Nobody has shown that Star produced shotshell tools but they did make some rifle reloading tools. Much of the information on the company is scarce. The original owner, designer, and patent holder of the Shell Reloading Machine was C.R. Peterson. The first shop was at the end of Beach Street in San Diego near the docks. Star moved to 418 10th Ave in 1935 and remained there until they closed their doors. The company made brass irrigation sprinklers for citrus and avocado farms and was a family operation through all the years. 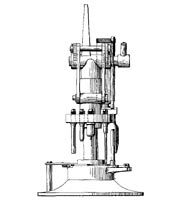 Peterson's nephew, Elard Mock, helped in the design of the first Star presses, although Peterson's name appears on all the patents. "Elard worked for the company for over 57 years..."
In the 1950s Elard Mock and Willis Brenizer bought the company from Mr. Peterson and Star Machine Works and it was one of the oldest, if not the oldest, family-owned business in the reloading industry at that time. Elard worked for the company for over 57 years. Star had an impressive list of calibers including .30 Carbine, .32 ACP, .32 S&W Long, .380, 9mm Luger, .38 Super, .38 Special, .357 Magnum, .41 Magnum, .44 Special, .44 Magnum, .45 ACP, and .45 Long Colt. The Star was introduced before standardization on 7/8x14 dies, however they can be adapted to use standard dies. Caliber conversion on the Star Universal is easy and can be done by changing out parts on the press or changing the shell plate and tool head for another caliber. The basic reloading tool includes automatic dispensing of primers, and powder. It requires hand insertion of cases, manual indexing of the shell plate, and finger feeding of the bullets. The manual operations can be eliminated with accessory items, but first we may wish to appreciate the effectiveness of the original design. Given an ample supply of brass, bullets, powder, and primers, an unmodified Star can deliver over 300 rounds per hour. The original Star assertion was "Reloads a box of shells in under 6 minutes". With the addition of a Hulme Case Feeder, it can be nearly doubled to 600 rounds per hour. Hulme Case Feeders were so popular that in 1959 Star drilled and tapped the steel floor base at the factory. "The design assures a long life with minimal wear." The circular design of the Star tool allows concentric self-cancelling torques so force from the various dies are developed around the entire circumference and any cocking effect from a given die is cancelled from a similar force from another die half-way around the press. This design assures a long life with minimal wear. The Star has six stations, starting with case feed/insertion (manually or via case feeder such as Hulme). The second station is full length resizing and removal of the old primer. The third station is neck expansion and new primer insertion. About 100 primers are stored in a brass storage tube. On the press downstroke a small plate moves the bottom primer into position under the case and a punch presses the primer into place. The upstroke retracts the punch and the slide returns to accept another primer. The fourth station is automatic powder dispensing, after which the bullet is manually placed on the case. The fifth station is bullet seating/(optional roll crimping). The sixth station is case removal/(optional taper crimping). Note crimping may be accomplished using either station. Taper crimping is the preferred method recommended by many reloaders and competitive shooters. A double-charge prevention mechanism sits between the last station and the first and is activated by the ejection of the last case and reset with insertion of a new case. Starting in 1956 competition came from other progressive makers. The 1970's introduced several companies that totally copied the Star design. The copy-cats never achieved much success, perhaps this was because Star's reputation was so firmly established and the words "Star" and "progressive" meant the same thing to most customers. We have yet to hear from a dissatisfied Star customer. many go 500,000 without any problems at all"
Maintenance is required to maintain the Star and it is important to keep it well cleaned and lubricated. By following simple maintenance procedures, a Star can process over 100,000 rounds with little more than a broken decapping pin and many go 500,000 rounds without any problems at all. There are users reporting millions of rounds on their Star, only changing worn parts and a few springs. The Star Reloading tool defines lifetime quality. Sources for this historical presentation include: Handloader Magazine, Kenneth Walters; Complete Guide to Handloading, Philip B. Sharpe; Handloader Magazine, Shooting Times, John Lachuk, and personal interviews and accounts. * Notes & Legal Disclaimers: Star Machine Works logo and original materials are from the former Star Machine Works Company, San Diego, CA. This website is not affiliated in any way with the former Star Machine Works. We do not claim to be experts. Some of our members have years of experience with the Star Machine Works Co. and their products. CAUTION: Reloading can be dangerous and any content, suggestions, or opinions offered by members, guests, or owners of this site are just that -- opinions. Check any advice carefully and proceed with caution. Always follow safety precautions or ask someone with more experience for assistance.